All weekend long from 2:30pm on Friday August 6th until 2:30pm Monday August 9th simply retweet the following message and your automatically entered. At 2:30pm Eastern Time we will use twitrand.com to randomly pick a winner of the $39.99 gift card from case-mate.com The winner will be notified immediately and can use the virtual gift card at checkout on Case-Mate’s website. 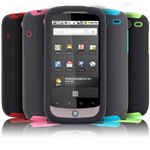 Case-Mate makes premium cases for most wireless phone models and most android models. The certificate will be awarded Monday and is available for immediate redemption. Should twitrand be down at the time of the drawing we will wait until it returns online to pick the winner. The Winner will be announced on Twitter. At the same time as I like a physical keyboard, after dealing with the Samsung Captivate for roughly quarter-hour, it is arduous to go back. At the moment I am debating whether to go to Verizon for the Droid X, move to Dash for the EVO, or stick with AT&T for the Captivate…choices, decisions.